The highest literacy rates in Malaysia are in Kuala Lumpur. Kuala Lumpur commonly known as KL is the capital and the largest city of Malaysia. The city is located in west-central Peninsular (West) Malaysia, midway along the west coast tin and rubber belt and about 40 kilometers (25 miles) east of its ocean port, Port Kelang, on the Strait of Malacca. In 2008 Kuala Lumpur was so popular that it was the 6th most visited city by tourists in the world. As of January 2018, the population of Kuala Lumpur is about 1.8 million people. Major tourist destinations in Kuala Lumpur include the National Museum, the Kuala Lumpur Tower, the National Monument, the House of Parliament, Istana Negara, the Central Market, the Batu Caves, the Jamek Mosque, and Merdeka Square. Kuala Lumpur covers an area of 243 square kilometers (94 square miles). Greater Kuala Lumpur, also known as the Klang Valley, is an urban agglomeration of 7.25 million people as of 2017. The geography of Kuala Lumpur is characterised by the huge Klang Valley. The valley is bordered by the Titiwangsa Mountains in the east, several minor ranges in the north and the south and the Strait of Malacca in the west. Kuala Lumpur is a Malay term that translates to “muddy confluence” as it is located at the confluence of the Klang and Gombak rivers. Kuala Lumpur's Lake Gardens are home to the Malaysian House of Parliament. The average elevation in Kuala Lumpur is 66 meters (217 feet) above sea level. It is unknown who founded or named the settlement called Kuala Lumpur. The history of Kuala Lumpur began in the middle of the 19th century with the rise of the tin mining industry, and boomed in the early 20th century with the development of rubber plantations in Selangor. The city was occupied by the Japanese (1942–45) in World War II. Its population greatly increased in the postwar years during a long (1948–60) communist-led guerrilla insurgency, and under a resettlement program new villages were established on the city’s outskirts. Kuala Lumpur did not become a true city until 1972, when it gained its status as such. Growth continued, spurred by industrial development; the population reached a half million in the mid-1960s and passed one million in the early 1980s. Today, Kuala Lumpur is one of the leading cities in the world for tourism and shopping. Kuala Lumpur comprises a mixture of modern and traditional architecture; such structures as glass-and-concrete skyscrapers, elegant mosques, Chinese shop-houses (family-operated shops with the business on the ground floor and the family’s living space upstairs), squatters’ huts, and Malay stilt kampungs (“villages”) betray Western, Middle Eastern, East Asian, and local influences. 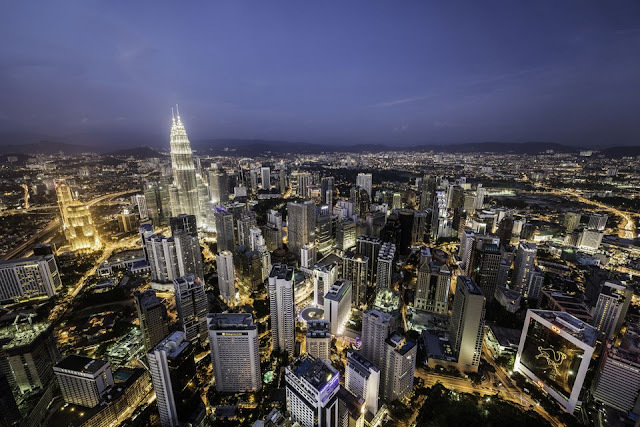 Kuala Lumpur is the fashion capital of Malaysia and has approximately 66 shopping malls. Famous malls in Kuala Lumpur include the 5 million square foot One Utama, and the Sunway Pyramid shopping mall with an Egyptian sphinx. The city is home to the tallest twin buildings in the world, the Petronas Twin Towers, which have become an iconic symbol of Malaysia’s futuristic development. According to the Council on Tall Buildings and Urban Habitat (CTBUH)’s official definition and ranking, they were the tallest buildings in the world from 1998 to 2004. The official residence of the Malaysian Monarchy if located on 13 acres in Kuala Lumpur. Malaysia is run by an elected monarch. This residence is called Istana Negara. Spanning 6.9 hectares (17 acres) below the Petronas Twin Towers is the KLCC Park with jogging and walking paths, a fountain with incorporated light show, wading pools, and a children’s playground. The park was designed to showcase a heritage of tropical greenery by integrating man’s creation with nature. The park itself contrasts as a calm environment in the midst of the hustle and bustle of the city. Kuala Lumpur is home to the Petronas Twin Towers. Though no longer the tallest buildings in the world (they held that record from 1998 to 2004) they are the tallest twin towers in the world. There is a two-story bridge connecting the twin buildings at the 41st and 42nd floors. The most commonly spoken languages in Kuala Lumpur include Bahasa Malaysia and English. The Kuala Lumpur Tower is a communications tower located in Kuala Lumpur. It features an antenna that increases its height to 421 metres (1,381 feet) and is the 7th tallest freestanding tower in the world. The roof of the pod is at 335 metres (1,099 feet). The rest of the tower below has a stairwell and an elevator to reach the upper area, which also contains a revolving restaurant, providing diners with a panoramic view of the city. Kuala Lumpur is home to a diverse population, including Indian, Chinese, Eurasian, Kadazan, and other east Malaysian descendants. Merdeka Square is one of the best known landmarks in Kuala Lumpur. The square is situated in the centre of the city. It was used as the cricket green of the Selangor Club. It was here the Union Flag was lowered and the Malayan flag hoisted for the first time at midnight (time: 12:00 AM) on 31 August 1957. In 1874 a deal was made that had put a British government official in indirect rule of Kuala Lumpur. Kuala Lumpur gained its independence from the British in 1957. Bukit Bintang is one of the most popular tourist attractions in Kuala Lumpur, perhaps because travelers like to shop. Bukit Bintang is the city’s shopping and entertainment center. This area is popular among tourists and locals, especially among the youths. Kuala Lumpur was occupied by the Japanese during World War II. It wasn't until the Japanese surrendered to the British, following the atomic bombing of Hiroshima and Nagasaki that Kuala Lumpur was released. The Istana Negara is the official residence of the Yang di-Pertuan Agong, the monarch of Malaysia. It is located along Jalan Tuanku Abdul Halim (formerly Jalan Duta) in Segambut, northwestern Kuala Lumpur. The palace opened in 2011 and replaced the old Istana Negara which was located at a different compound in central Kuala Lumpur. Kuala Lumpur is prone to flooding during periods of heavy rain, with an average elevation above sea level of only 72 feet. Monsoon season can often cause flash flooding. 11 km (7 miles) north of Kuala Lumpur, Batu Caves is a 400 million-year old limestone hill with a 100-year old temple incorporated within it. The cave is one of the most popular Hindu shrines outside India, and is dedicated to Lord Murugan. It is the focal point of Hindu festival of Thaipusam in Malaysia. Many in Asia refer to Kuala Lumpur as simply 'KL'. The residents of Kuala Lumpur are referred to as KLites. Kuala Lumpur is the cultural, financial and economic center of Malaysia. The city is home to three of the world’s 10 largest malls. Greater Kuala Lumpur is among the fastest growing metropolitan regions in South-East Asia, in both population and economic development. Kuala Lumpur became the capital of Selangor, later the Federated Malay States, and then Malayan Union, and finally Malaya and Malaysia. According to government statistics, Kuala Lumpur has a literacy rate of 97.5% in 2000, the highest rate in any state or territory in Malaysia. Although Kuala Lumpur is touted as one of the host cities for the Formula One World Championship, the open-wheel auto racing A1 Grand Prix and the Motorcycle Grand Prix, races are held at the Sepang International Circuit in Sepang in the neighbouring state of Selangor. Football is one of the most popular sports in Kuala Lumpur. Other annual sport events hosted by the city include the KL Tower Run, the KL Tower International BASE Jump Merdeka Circuit and the Kuala Lumpur International Marathon.